On a beautiful spring day with the temperature easily in the 60’s, we decided on a quick drive up to the Arras battlefields and had a pleasant walk around the south east side of Monchy, covering the area around Bois du Sart and Bois du Vert, The Mound and Infantry Hill. On the way we stopped off at the two German blockhouses at Wancourt and two cemeteries, Henin Communal Extension and Wancourt British Cemetery. Above: Images of the larger blockhouse, presumably a command post that was built for defence with several embrasures. The entrance and an embrasure can be seen in the first image. Interior images are poor as my cameras flash decided not to work!! ABOVE: HENIN COMMUNAL CEMETREY EXTENSION, HENIN-SUR-COJIEUL (P. De C.). 5 miles S. of Arras, 2 ½ miles NE. of Boyelles Sta., 750 yards S. of village, near St. Leger road. Henin was 1 ½ mile behind front line at beginning of Battle of Arras April 1917, and was used from April to Nov. 1917. Records 191 U.K. burials and 2 special memorials. First image and above text from "Silent Cities"
Capt. and Adj. H. Burkett, Kings Own Yorkshire LI, died 5th June 1917: “POURED OUT THE SWEET RED WINE OF YOUTH”. Gunner S.L. Carter, RGA, died 21st May 1917: “A SORROW’S CROWN OF SORROWS IS REMEMBERING HAPPIER DAYS”. ABOVE: WANCOURT BRITISH CEMETERY (P. De C.). 5 ¾ miles SE. Of Arras Sta. S. of main road from Arras to Cambrai. Captured on April 12th 1917, after very heavy fighting. Records 1,026 U.K., 246 Can., 1 Bermuda, 566 Unknown burials, and 96 special memorials. The area Bois du Sart / Bois du Vert / The Mound / Infantry Hill, to the east of Monchy, was reached by the British at the formal end to the Battle of Arras. After the Battle of Arras drew to an official close, the British continued with a policy of active defence in order to cause doubt in the mind of the enemy as to whether the Battle of Arras was to be further developed. The British also hoped to capture the high ground of Infantry Hill – Bois du Vert which would give views almost to Cambrai. Bois du Vert itself was on ground which sloped down to the valley of the River Cojeul, and the enemy positions where not visible to the British. Fighting consisted of confusing and fierce raids launched by both sides during the remainder of 1917. 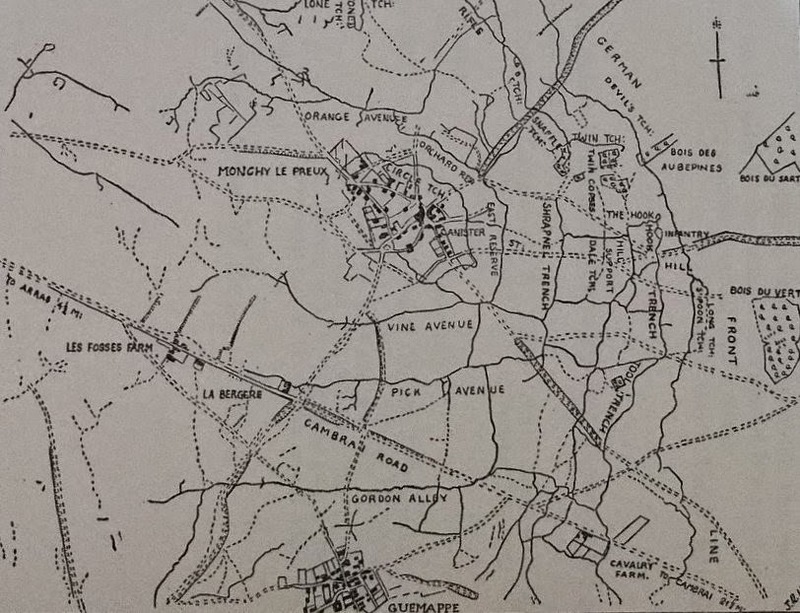 Above: Map showing battlefield to the east of Monchy le Preux. The site of Bois du Vert, now removed. This wood was on the reverse slope so not visible to the British observers. Above: British 18 pdr HE shell and battered trenches, Bois du Sart. Last image shows a British Mills bomb with Bois du Sart in the background. Finally, three images which caused a bit of discussion between myself and my brother; was this a British observation post constructed in an old cellar?? At the time of the fighting the British were unable to occupy Monchy due to German shelling with the exception of a handful of observation posts. The photos show an obvious old cellar with a hole knocked in the wall giving excellent observation over the Bois du Sart and the battlefield but is it period, who knows!! !